Today I have the pleasure to introduce an author whose book was made into a film (and with such great actors, too). Since I just returned from Jerusalem and have been to Damascus and Syria in the early 90s I’m particularly interested in this book. Howard Kaplan has kindly agreed to write a blog post to tell us about his book and success story. “When I was in my early twenties backpacking through Europe, a friend and I flew on a lark to Lebanon. In Beirut, we learned a shared taxi service—nine seat diesel Mercedes Benzes—ran regularly between Beirut and Damascus and Syria routinely issued visas at the border. Damascus is the oldest continuously inhabited city on earth, an oasis surrounded by apricot orchards as underground rivers from Lebanon come up there. So we went. Among the places we visited was Marjeh Square, where the Israeli agent, Eli Cohen, had been hung. Later, I wanted to set a suspense novel in Damascus with rich details, sights, sounds and smells of this marvelous city. 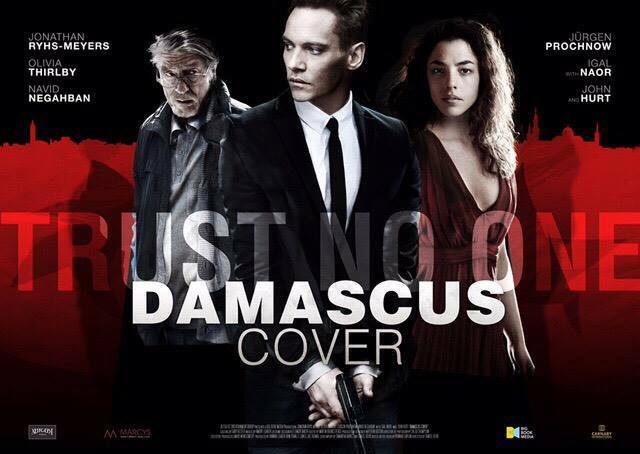 So that was the kernel of The Damascus Cover. I created a story about a high placed Israeli spy in the Syrian regime patterned after Eli Cohen. What I didn’t know when I wrote the novel was that it would become an artifact of what Damascus was like before all this destruction. So I’ve kept the novel exactly as it was in the reissue other than a new foreword. The novel was highly successful when it came out in 1977, was translated into seven languages and climbed up the Los Angeles Times best seller list for three months. Then like most novels it disappeared. By utter chance, the director, Dan Berk, was looking for a Middle East story, happened to mention it to a mutual friend and she gave him my novel. He read it, called me, we met for coffee in Los Angeles where we both live and the deal was done then and there—no agents. Dan had a vision of what made the novel contemporary which matched mine. In its secret heart, The Damascus Cover, is a novel of reconciliation between opposing sides, or more specifically how intelligence services and the military, while still enemies, can cooperate to create a greater good the politicians will not. Dan wrote the script himself and got the producers of Gosford Park onboard. They showed the script to Jonathan Rhys Meyers to play Ari, the main lead, and he called the next day and said he was eager to do it. Then came John Hurt as the head of the Israeli Secret Service in the vein of his role in Tinker, Tailor, Soldier, Spy. They attracted an international cast and we have Jurgen Prochnow, the great German actor most famous for Das Boot, as well as Navid Negahban, who played Abu Nazir in Homeland. We shot in Casablanca and Jerusalem; I was on set for a week of the seven week shoot. The film is in post production now and will premier at the Berlin Film Festival in February 2016. I had some experiences when I was 21 and 22 traveling to the Soviet Union to smuggle out a dissident’s manuscript on microfilm, and transferring another manuscript, on my second trip, to the Dutch Ambassador inside his Embassy. Under the Soviets, all unpublished writing remained property of the Communist State, so émigrés would have to leave all their uncensored works behind. On my second trip I was arrested, interrogated by the KGB for four days and then released. They grabbed me in the Ukraine for meeting with dissidents, I had nothing incriminating on me and they did not know about the manuscripts I’d transferred. It was rather a benign interrogation in the hotel manager’s office, with bathroom and food breaks available. In the end they brought a prosecutor to my hotel room and expelled me on my scheduled flight to London, citing a humanitarian gesture. It was the era of détente and I think my American passport really did protect me so I was nervous but not panicked. They arrested me on the tenth day of a fourteen day tour, held me for four days in house arrest and would not let me contact the Embassy. Had they held me beyond my scheduled flight I think I’d have been terrified. I worked too with sending other college students into Russia to meet dissidents so what I learned through these colleagues in London, who remain among my closest friends, created a mindset that permeates my thrillers. The Damascus Cover is the first novel in The Jerusalem Spy Series which initially will be comprised of 3 novels that share a common theme: reconciliation and hope. The second novel, Bullets of Palestine is out and is about the tensions, trust and mistrust, between an Israeli agent and a Palestinian agent as they work together to kill Abu Nidal, an extremist terrorist. To Destroy Jerusalem is a work about the nuclear threat to the region which I expect to bring out in early 2016. HOWARD KAPLAN, a native of Los Angeles, has lived in Israel and traveled extensively through Lebanon, Syria and Egypt. At the age of 21, while attending school in Jerusalem, he was sent on a mission into the Soviet Union to smuggle out a dissident’s manuscript on microfilm. His first trip was a success. On his second trip to the Soviet Union, he was arrested in Khartiv in the Ukraine and interrogated for two days there and two days in Moscow, before being released. He holds a BA in Middle East History from UC Berkeley and an MA in the Philosophy of Education from UCLA. He is the author of four novels. The books sounds so interesting, and the movie sounds like one I definitely want to see. The author’s experiences are fascinating. Thanks for sharing. Thanks Christoph. I have the novel in my list to be read, and I hope to dedicate it a post soon too. Thanks for the reminder! These books sound intriguing, as do Mr. Kaplan’s experiences in Russia. I am reblogging and sharing.